Great quality and lightweight. Super absorbent! They are very pretty and look like the picture. They are absorbent but dry quickly. Take up less room in my luggage. Exactly what I wanted. A thin towel WITH terry cloth. Very nice looking. Fringed edge gives it an upscale look in the bathroom. Not overly big, but its size is longer than regular towels so check your towel bar height. Slowly eliminating the thick towels that are bulky to use. I like the new look of the Pestemal towel. Soft cotton and beautiful grey color. These towels are glorious. They’re super absorbent Turkish on one side and terry on the other. A nice introduction to Turkish towels with terry for the uninitiated! Towels that really dry you. Loved these towels, plan to purchase more. They are very absorbent, wash beautifully and love that they are not bulky. Nice to take when you travel (work well as a beach towel or at home). I Thought they would be of a cheap fabric, but they are attractive and soft. I recommend these if you do not like towels that leave you feeling "wet". I bought these towels a few years ago for our pool and we are now ordering more. They are big and absorbent but not bulky & heavy like the usual beach towels people lug around. They're soft, wash well, maintain their color and they take up less space in the laundry and the linen closet. Highly recommend. Cute towel! Goes perfect with the colors in my bathroom, which I'm very happy about because you can't always tell the colors by the pictures shown. The only concern I have is how it will hold up in the wash. The tied fringes on the ends of the towels look to be a little delicate, otherwise, it seems to be a well made towel. I was on the hunt for towels that would not hold that musty smell after washing. 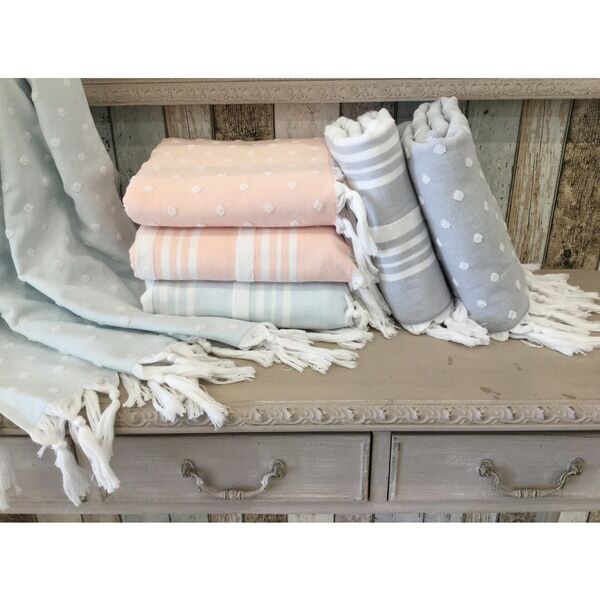 Turkish style towels were recommended and I found these beauties on Overstock.com. They did not disappoint and are still getting the job done over a year later. Soft, beautiful color. Highly recommend. Absolutely LOVE this towel will be ordering at least five more. Towel is extremely thick wicks water and has a great print!!!! Cute and very absorbent. Got a lot of compliments on it. This towel is awesome! Awesome color and style! This towel is so soft and nice love it. Nice towel. Kinda thin but made well. Beautiful towels, very happy with purchase. "After washing, does the fring tangle and knot together?" No, these towels have held up well for us. Absolutely no knotting together, the fringe hasn't even twisted together..
"What is the weight of this towel? I have towels that are 450grams (7+ oz.) and I like them. I also purchased towels that are NOT an adequate weight (from another online retailer) for being absorbent - they are true peshtemal towels - fine for certain things, but not bath towels." "Is the back side terry cloth?" I'm not sure that it's terry cloth in the traditional sense but they are soft. Very absorbent. "Any chance you will be restocking the gray dot or stripe?" "The price shown is for a single towel or multiple?" This purchase includes 1 towel. It looks pretty and seems like good quality.